Great holiday with great friends. This was my third stay at this hotel, just love it. Has there been a big change of staff lately? Just noticed that the service was not up to its usual 5 Star standard. When seated for dinner we would wait up to half an hour before we were even asked if we wanted drinks. There was no follow up for further drinks, we had to try and get the attention of a staff member. Water was not provided unless asked and then never topped up. We went searching for the jug ourselves. Main meals were served while our entree plates were still on the table - which some also remained for the entire evening. This happened in both the Vero and Elements restaurants. Poolside service was minimal. In past visits staff would walk around to check if you needed anything - did not happen this time. I know you can press the buzzer to call the staff member, this did not work - no show. There was an issue with housekeeping one day - we had accidently turned the DND light on when leaving for a tour. A card was left for us to call upon our return and the room would be cleaned promptly. We called at 4:30pm, was informed it would be done immediately, went for dinner, returned at 11pm and found the room unchanged. We called again, this time housekeeping attended, grateful, but it was 11pm and we were hot and tired sitting on the balcony. Don't take the above as complaints, merely an observation from us. Use it to further train your staff. They need to be attentive, not missing in action, particularly if you want guests to eat, drink and spend at the hotel. If the service is lacking they will go elsewhere to spend. In previous visits our rooms - both an Ocean View and a Standard Deluxe - had a Nespresso coffee machine. This time the machine was missing. Upon enquiring about this we were told that the Standard Deluxe rooms do not have Nespresso machines - a little hard to believe when we had the machine in a Standard Deluxe room on a previous visit, and there were &quot;pod&quot; spots in the room amenities. It would be great if the bathroom had some hooks outside the shower to hang towels. Housekeeping did a wonderful job with our room each day, we are very appreciative. The yoga teacher was terrific. The Spa ladies were brilliant. Apart from the few issues above we had a great time and will return again. Stunning hotel with a bit of a twist ! We love this hotel and was a lot better than we expected. Staff were very friendly and helpful specially the staff by the pool side . The room was stunning !!!! Very spacious with a very large bed and open bathroom . Beautiful !! I had read that some of the the rooms were far away from the main reception and this didn’t put us off but we were allocated a room quite a long way away and the hills are very very steep . In the hot weather there is no way you could walk . However, the whole complex Has little buggies and cars to take you everywhere. As soon as you called reception within minutes the buggy arrived. We really enjoyed this part of our stay. The drivers were really friendly and it was quite fun to jump in the car without doors to be taken up and down the steep hills to and from the front gate. When you got in at night A car would come to the gate to take you all the way up the hill to your room. Have already recommended this hotel to our friends we will definitely stay again ! Gorgeous hotel and location, everyone was very helpful and pleasant. The atmosphere is lovely and relaxing. Also thank you for arranging the birthday cake and decorations for my partner even though it wasn’t requested, really good touch! Relaxing , fun , ate too much as food was outstanding. 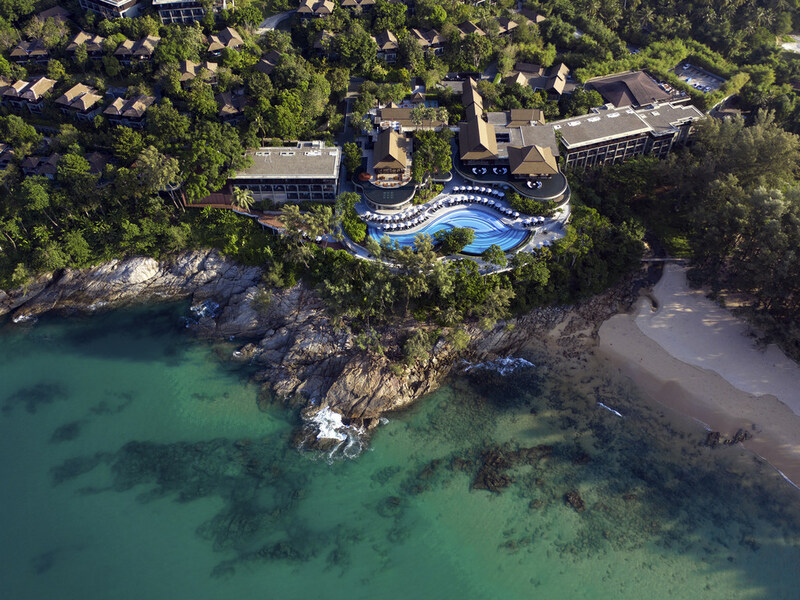 The hotel location is far from Phuket downtown but quite close to the international airport. Resorts facilities were sufficiently provided , good food experience in element restaurant, great services in general but the outstanding person is Gam . The Vela is a good alternative itatalian option. Gorgeous resort - wonderful staff - quite a find ! Fabulous - loved the first room, sea view was even better. Staff could not have been more friendly, obliging, Inclusions were generous and honoured without question. I would question the behaviuor of some guests and their children at the buffets. Who knew to bring tupperware to breakfast to feed the family for the rest of the day.... Men should not be permitted into restaurants shirtless. Great staff great views and very clean. Good amazing. Located about a 15 minute drive from the airport, this classy hotel was ideal for a 1 night stay. Excellent staff and check in was easy. Room was modern and bright and spotless. Restaurant was also very good. Loved the ambiance, had a lovely time there met some lovely people, the pool areas were fantastic, the staff were very polite and most helpful. We booked the Italian restaurant, however, we were disappointed, it was very dark, I could not read the wine list a light was brought to the table, the meal was also disappointing the portion was very small more suitable for a child, it was very dry with no seasoning, we did enjoy our stay there, breakfast 10/10. This is our second time at the Pullman Arcadia. It's a great location with a wonderful team that look after us once again. The rooms are very comfortable and the restaurants are bars offer a good variety. Our son was well looked after by the babysitters and the ladies at kids club. Ginger and the team at the Azur Pool bar were amazing. Some parts of the rooms and the main pool are showing signs of wear and tear but we understand the pool is scheduled to have work done this year. We will definitely be back. I really feel welcome here in this hotel. All the staff are very warm and friendly. This hotel also have great facilities for you to enjoy while staying here. Gorgeous hotel, friendly reception and staff. Stayed at the hotel in the evening to enjoy the drinks at the lounge and had dinner at the restaurant. Both were very enjoyable. Room was beautiful and clean with a excellent view. Loved our stay very much. Friendly, efficient staff, where nothing is to much trouble.every area within the hotel is spotlessly clean at all times, including the rooms themselves. Food quality is excellent, but is a little on the expensive side at times. Beautiful surroundings, we had a fabulous holiday. Sunny, tranquil and restful week in Phuket. Perfect. Hospitality and care of the Pullman Staff was tremendous. Kudos to Ice at the C-Bar! !